Spektre Domina - Silver w/ Rose Gold Mirror Need Help? Founded in 2009, Milan based Spektre has fast become internationally renowned for their fashion forward designs, which blend high fashion and street style seamlessly. With its special attention to innovation, design, details, materials, and colors, its no surprise that models and street stylists alike gravitate to the independent brand. All frames are proudly handmade in Italy, with Spektre overseeing the entire production process. Spektre Domina is a classically inspired aviator shape, but super-sized and topped off with flat lenses for added appeal. 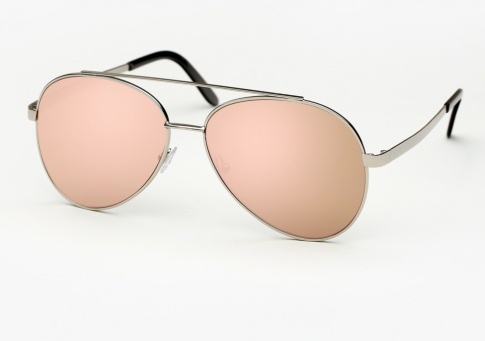 It is offered here in silver with flat rose gold mirrored lenses.